Hello, I’m Jason Sisney of the Legislative Analyst’s Office. This presentation is about public employee retirement benefits in California, which have been a source of a lot of controversy in the recent years. When looking at public employee retirement benefits, our office really has three main principles. First, public employee retirement benefits are really just a part of overall public employee compensation. During their working lives, these men and women earned pension and retiree health benefits that they have a right to draw upon later, during their retirement years. Encouraging retirement savings through deferral of some part of compensation is a good policy. And that’s really our second basic principle. Whether it be a public employee or a private sector employee, saving for retirement is a good thing. And public pension systems are one way that public employees and their families save for retirement. The third principle is that a well-managed and properly funded retirement system, is therefore a good thing. Our key issue is, whether or not, public retirement systems have been well managed and properly funded in the recent years. And as we look at those issues through the rest of this presentation, you’ll see that there have been some problems. state and local retirement costs in California have been growing substantially in recent years. And that points to some of the problems that have emerged, and how the state and local governments have financed retirement systems. This figure shows the growth of state retirement contributions for several categories of state employees. In the late nineties, as investment returns of our public pension systems boomed, the pensions systems essentially gave the state a funding holiday. You can see, the contributions dropped next to nothing. At that time, the state and many local governments increased benefits, and shortly thereafter the investment markets took a downward dive, and then later in the decade in 2008, another downward dive again. And these factors have contributed to the large increase you see in state Pension Contributions thereafter. In 2010-11, the state’s contributions would have actually been several percentage points higher than you see here, as a percent of payroll were it not for recent agreements that lowered benefits for future employees, and increased employee contributions to pensions, both for current employees and future employees. 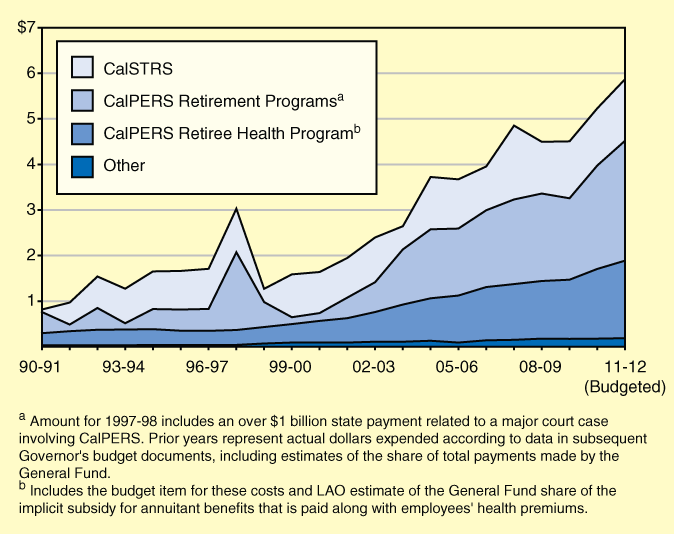 This next figure shows the growth of state retirement costs in the general fund in billions of dollars, and this figure looks not just at the state’s contributions to CalPERS pension programs, but also to retiree health programs managed by CalPERS, as well as to the State Teachers’ Retirement System. In the 1990’s these costs were around one to two billion dollars a year. But as you can see they’ve grown substantially recently, reaching about six billion dollars in the governor’s 2011-12 budget plan. And this next figure shows another way of looking at those same costs, this time as a percentage of the state general fund. In the governor’s 2011-12 budget, state retirement costs grow to about seven percent of the budget. Local governments actually have sometimes even greater costs as a percentage of their general fund because local governments spend a much greater percentage of their budgets on payroll and personnel. Under current law, the laws that are in effect today, it’s very easy to foresee that state retirement costs could grow to seven billion dollars or more within just a few years. But even that’s not enough. The state and other governments have made decisions, that essentially have led to a number of pension systems being underfunded. CalSTRS, for example, would require over three billion dollars more per year, beginning right now, to fully fund all of the contributions that actually say that fund needs. The University of California Retirement System needs hundreds of millions of dollars more from the state, and from other sources. And the state like most governments, doesn’t really deposit anything to cover the future costs of retiree health benefits at all. And if the state deposited as much as actuaries said is needed, that would be over a billion dollars a year. And that would all be on top of these costs that you see here, in this figure. There are a number of problems with the current public employee retirement system. First, there is a tendency to defer costs to future generations. 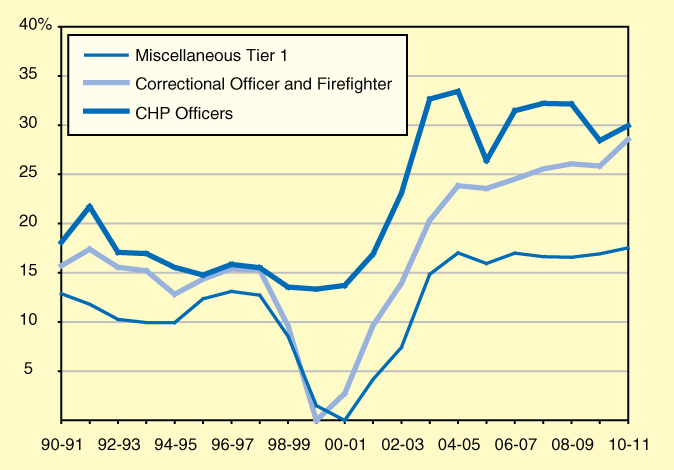 California governments in general, have paid the normal costs pension benefits for many decades. Now the normal cost, that’s the amount that needs to be set aside each year and invested, in order to cover all the future cost of benefits that public employees earn, while working in that year. California governments have been contributing to those normal costs for a long time for pensions, but even when they do, unfunded liabilities can emerge for a variety of reasons: changing demographics in the retirement system; the granting of retroactive benefits, that is benefit increases applied to previous years already worked by employees; and excessive optimism by pension systems about their future investment returns. So even though California governments have been making very large payments to pension systems in most years, these unfunded liabilities have emerged recently. And that’s been one of the key drivers of the increased cost that we talked about previously. For both the University of California Retirement System and state retiree health benefits, as well as most retiree health benefits at the local level, no money has been set aside to pay normal costs, and so unfunded liabilities have just grown and grown and grown over the years. Unfunded liabilities in pension systems really are like a credit card balance. And when a consumer pays the minimum balance each month or less, the balance in those credit card accounts can really grow. And that’s essentially what happened to a number of our pension systems. Unfunded liabilities have grown, and state local governments as well as the University of California and others, have not been contributing enough to keep those unfunded liabilities from growing further. Another problem with our current system is that pension benefits are inflexible. Case law in California is very protective of public employee rights. And so even though state and local governments of California clearly need a lot of budget flexibility, pension systems allow almost no flexibility to change, without receiving the negotiated agreement of employees themselves. Another issue is that, employers and taxpayers bear almost all of the financial risk in the current pension system. Generally speaking, employee pension contributions are fixed, a certain percentage of payroll. That means if investments returns don’t materialize or something else changes, the employer and therefore taxpayers, pick up the increased cost through increased contributions. Another problem is cost volatility. When the market goes up and down, when benefits and demographics change, contribution rates of employers can go up and down. 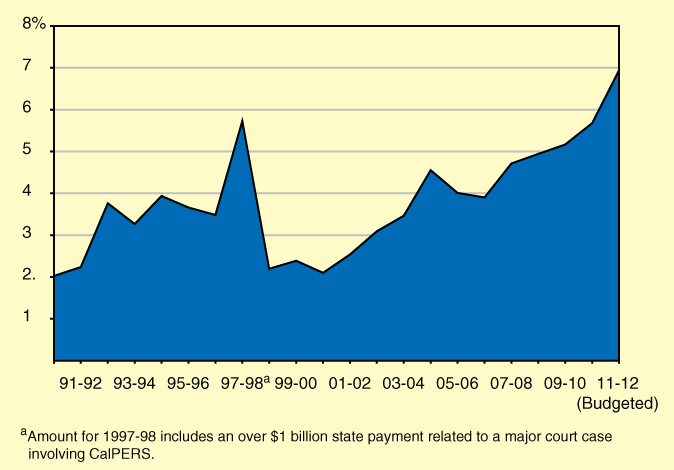 You saw earlier that in the late 1990s, public employers like the state received essentially a pension funding holiday. Then just when they could least afford it, when the economy went south, investment returns of pension system went south as well, and costs for employers went up just at the time they couldn’t afford it. And existing benefits of our pension system are very generous. Compared to other states, Californians have typically given their public employees richer retirement benefits in recent years. And even after some recent changes at the state level to reduce benefits for future employees, these benefits are often much more generous than the retirement benefits in the private sector. In the private sector defined benefit pensions and retiree health benefits, still the norm in the California government, are increasingly non-existent. A key question that we think needs to be asked is this: can the substantial disparity between public and private sector retirement benefits be sustained much longer? We think that it probably cannot. But we do think that there are reasonable options to improve California’s public employee retirement systems. For the future, we think there are potentially new models that can be used for retirement systems for future public employees. One would be to take the existing defined benefit pension model, and to incorporate more cost sharing with employees. Now earlier, we talked about how when costs go up, employee contributions generally are fixed. Under this idea if costs go up, due for example, to lower investment returns, both the employer and the employee would see some of those costs built in. If costs go down due to greater than expected investment gains, both the employer and the employee could see savings. Another option is a hybrid program. This would take the defined benefit programs that are today in place, make them less generous--less generous benefits--and combine them with employers contributions to a defined contribution account. This is essentially like a 401k. There are several advantages to these new models. For the defined benefits program with more cost sharing, there would be more transparency about the costs of these benefits, for both the employer and for workers alike. We believe that under this model, employees will be less likely to seek unsustainable high pension benefits because, after all, if the costs end up going up, they would bear a cost as well. And we believe that this type of model would encourage greater fiduciary care by retirement system boards, many of whom are elected by public employees. Hybrid programs have the advantage of employers continuing to help employees save, employees continuing to benefit from certain features of the tax code. And these make unfunded liabilities much less likely to occur. Unfunded liabilities occur with defined benefit programs, because the benefits are set, even if the investment returns don’t materialize. In defined contribution programs, if the investment returns don’t materialize, that risk is placed on the employee, not on the employer and the taxpayer. Another option for the future that’s very important is to end the retroactive granting of benefit increases. Benefits should only be increased for future years of service. Another option is to make sure that public employers and employees pay pension costs as they accrue--no exceptions. And in particular, there’s a need to start paying retiree health pre-payments by 2020, that is, beginning to set aside funds to cover the future cost of retiree health benefits. In the future, there needs to be much greater clarity about employer obligations. Right now it’s often unclear what benefits pension and retiree health can be modified, or adjusted by the employer in the future. We need to be crystal clear from the moment a public employee is hired, about what benefits can be modified, and which cannot. What should the legislature do? The legislature has the power to make a lot of changes in the employee retirement area. Both at CalPERS, CalSTRS and the UC system, as well as in the local pension systems. For CalPERS and the local pension systems the legislature can pass laws or approve MOU’s, that implement the new models of pension benefits that we discussed. The legislature also has the power to prevent CalPERS or county retirement systems from offering some of the really generous retirement benefits: 2.7 at 55 for miscellaneous employees, and three percent at 50 for future employees. The legislature can also prevent the retirement systems from offering benefits based on the single highest final year of compensation, which encourages pension spiking. For state retiree health benefits, the legislature can specify that it has the ability to change benefits or modify benefits in the future, for future employees. When these employees retire thirty to forty years from now we have no idea what health care would be like. And so it is only sensible that the state reserve a greater right to adjust benefits in the future. For CalSTRS pension benefits the legislature can amend the law, to require that future teachers receive only the same types of retirement benefits allowed for state and local employees in the future. The legislature also can specify that future benefits for teachers will be paid entirely from district and employee contributions. Over time, this would allow the state to gradually decrease its funding role for the CalSTRS system. The state, however, will probably need to be involved for many years, probably several decades, in providing funding to CalSTRS, because as we mentioned earlier, CalSTRS has a large and growing unfunded liability that will require funding from some source, state or district, or employees, to the tune of several billion dollars a year. And for the UC retirement benefits, there is probably the likelihood that the state would need to resume voluntarily giving UC funding to help it address its unfunded liabilities within a few years. As a condition of providing that money, the state can specify that UC employees in the future will only receive the types of benefits allowed for the state, and local, and school district employees as well. The state should encourage retirement savings by public employees and others. The current public employee retirement system however, is too expensive and too inflexible. And the goal should be to preserve robust public retirement systems that can benefit public employees in the future. Flexible systems that are customizable to local needs, and to state needs, and to the University of California as well. Slides for a full presentation on this topic can be found here.